While both tofu and tempeh come from soy beans they are made with different processes. Tofu comes from curdling hot soy milk with a coagulant, while tempeh is made from slightly fermented cooked soy beans. While both are good sources of protein, the fermentation process and the retention of whole beans gives tempeh a higher content of protein, dietary fiber and vitamins than tofu, as well as firmer texture and stronger flavor. 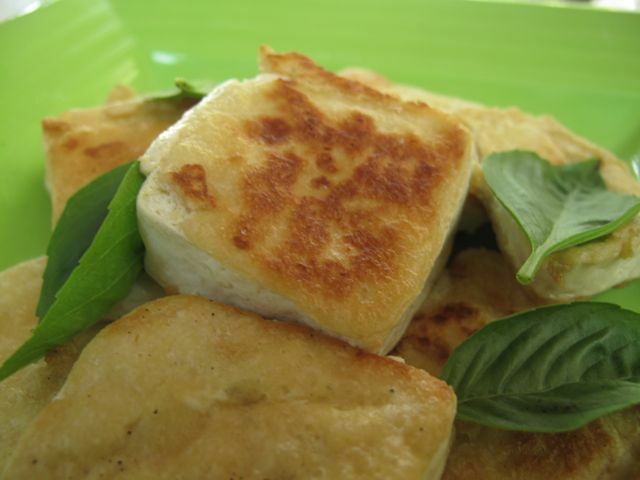 Tofu is quite bland alone, but is a sponge for flavours, making it highly versatile as an ingredient. As a rule of thumb you could try preparing it in the same way that you cook chicken, using similar seasonings , best just to try and see what works for you. 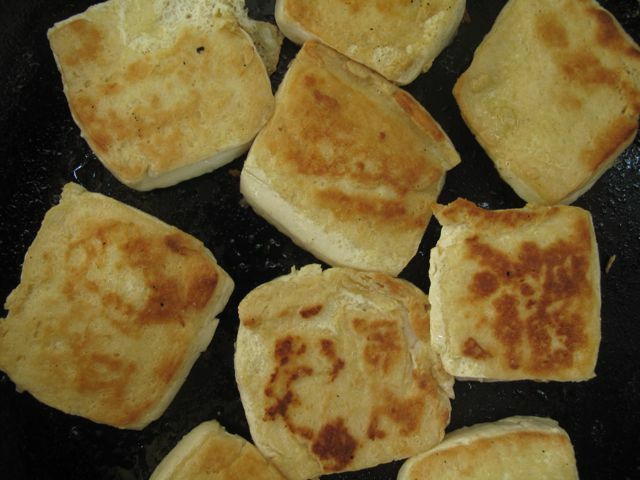 Silken tofu can be pureed and used in sauces, while the firmer tofus work well in stir fries or baked in the oven. In Indonesia it is often deep fried which makes it tasty but not particularly healthy, and I have spent years experimenting to find the best way to cook it. Generally I keep it simple with a meal of tofu and salad, or a tofu sandwich layered with crispy tofu, grated carrot, sesame seeds and lettuce.To cook the tofu, first pat dry with absorbent paper, sprinkle with salt then pan fry in a thin coat of corn oil with sliced garlic and a little fresh ginger. Cook till golden. A drizzle of kecap manis (sweet soya sauce) at the end adds a sweet flavour, while a sprinkle of black sesame seeds adds a crunchy texture. Recently I tried the Caprese Kampung at Desa Seni. 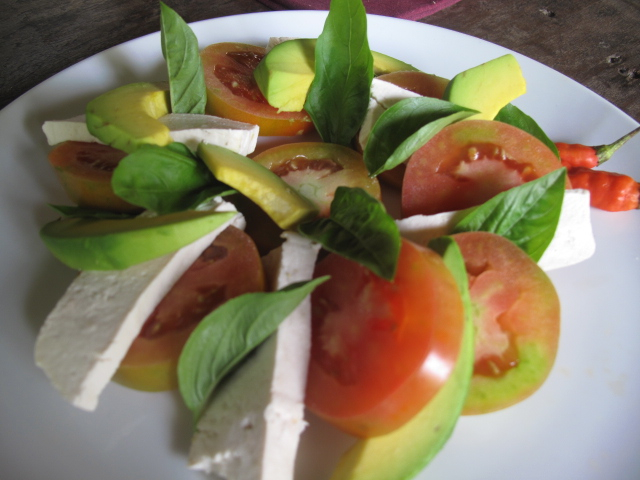 I am a huge fan of buffalo mozzarella and always love a Caprese salad, but this one exchanges mozzarella with fresh tofu, layering it with avocado, kemangi (Balinese lemon basil) and firm but juicy tomatoes with a tangy sambal vinaigrette. The taste is incredibly fresh and the sprinkle of crunchy fried shallots adds extra flavour. I will see if I can get the recipe so watch this space! Another of my favourite tofu dishes is at Clear in Ubud, I think its called the snow crusted tofu – or something like that and I have been trying to recreate it. 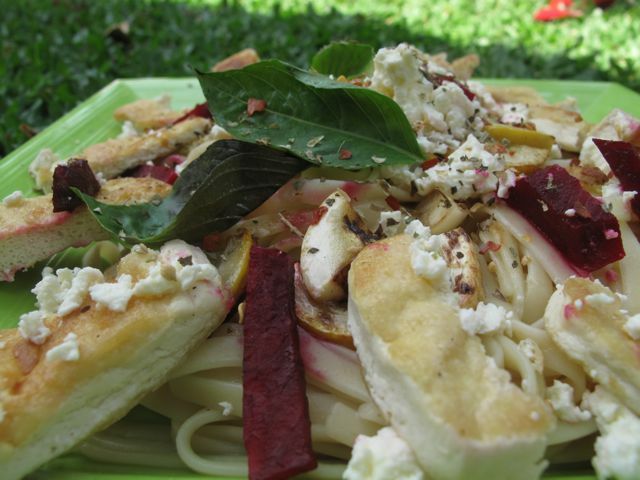 My version is different – but it tastes pretty good. Mix the tofu in a bowl with the coconut syrup and coconut until all the cubes are coated. Spread out on a baking sheet and bake for 30 minutes, or until the coconut begins to toast. Serve with rice, or mashed potato. Sprinkle the tofu with salt and lightly pan fry, adding the garlic and shallots after a minute or so. Cook till golden. Meanwhile boil or steam the broccoli until cooked (but still firm) strain then add to tofu garlic mix and heat through. Cube the cooked tofu and lightly mash the brocoli and add the feta cheese. Boil the pasta till al dente, toss with olive oil, then add the tofu /broccoli mix and serve with a sprinkle of parsley. These tasty cubes of tofu are great as canapes, served on toothpicks. Cut the tofu into bite sized cubes and place in a large bowl. In another bowl combine all other ingredients (except fresh coriander and lemon.) Spoon the mixture over the tofu and toss well until evenly covered. Marinate for at least one hour (overnight is even better.) Spread on a baking tray and bake for 1 hour at 200 degrees Celsius. Transfer to a platter and sprinkle with lemon juice and fresh coriander. Cook the rice and soy sauce, then rinse until water runs clear. Put in a bowl and mash with chilli sauce, egg yolk, flour, chives, coriander, salt and pepper. Roll into 12 balls and flatten into patties. Heat oil (3 cm depth) in fry pan. Add a few patties at a time and cook on each side till golden brown. Put tofu on baking tray and sprinkle with soy sauce and chilli oil. Cook in pre heated oven at 200 Celsius for 20 minutes. Fry sunflower and sesame seeds , add carrots and mushrooms and cook for a few minutes. Add hoisin, soy sauce and rice vinegar and 200 ml water and continue cooking for two minutes. Stir in spring onions, roast tofu and salt/pepper. In a separate wok/fry pan stir fry bok choy for 2 – 3 minutes. To serve Put three rice patties on each plate, with bok choy, tofu and mushrooms alongside. Sprinkle with coriander. 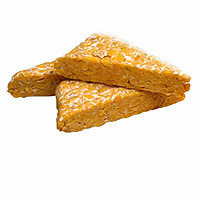 Tempeh has a slightly sweet nutty flavour and much thicker texture than tofu. The Tempeh penyet (fried in batter) that you find in the street markets in Jogjakarta (Java) is divine, but once again a little too oily to be healthy. The thing is tempeh definitely tastes better when its crispy, and although I have tried baking it, I find its tastiest if I pan fry in just a little corn oil with some garlic (you can soak in water and salt for a few minutes first to make the tempeh a little more moist.) I then use the crispy strips to make tempeh burgers or sandwiches or just toss it into a salad. Recently though I have been experimenting with tempeh manis, a sweet and crunchy dish that’s popular in the warungs here. Its really good sprinkled on salad.